To evolve to the next level… we have to consciously dodge all the evolutionary problem societies create in their life cycle… before they destroy themselves. Hundreds of Societies have risen and fallen in the last 100,000 years since the development of modern man… Homosapien. Let us look at what our technological society is doing to the planet that we are evolving on and what other effects it may cause in the illness-ridden guinea pigs and Sheeple. One good reason that we might want to learn how to raise our vibratory frequency is because of the exponential rise of electromagnetic field (EMF) background radiation… Scientists estimate that YOUR daily exposure to EMF radiation is 100 Million Times higher than it was in your Grandparents’ time. This frequency is lowering your biological vibratory frequency making you more susceptible to environmental pollution and disease as you age… disconnecting you from spirit and your true nature. In normal consumers all over the planet, research shows that these fields have a significant disruptive effect on the natural energy levels of your body. They magnify your body’s “flight or fight” responses, compounding your adrenal loads from other stressors and significantly reducing your ability to cope effectively. One of the greatest problems is that the EMF fields are adversely affecting… the dehydrated bodies in 80% of the people in the developed world… accelerating its effects… like running a race car without proper coolant. Dr. Neil Cherry, a biophysicist and an elected official in New Zealand, said that studies indicate that non-ionizing radiation causes everything from cancer in lab rats to neurological changes in humans. Dr. Cherry stated that human beings are very good conductors of microwave transmitted signals. Living organisms are themselves electromagnetic instruments of great sensitivity that can support a variety of electrical vibrations… these can be interfered with by external radiation… both at microwave and very much lower (ELF) frequencies… in a number of ways, from which adverse health effects can follow. With the explosion in radio and TV broadcasting stations, radio telephone networks, cordless phones and cell phones, the density of radio waves and microwaves around you is now many millions of times higher than natural levels. The same applies to Extreme Low Frequency (ELF) fields produced by the dozens of electrical appliances in households in the industrialized world and the power lines feeding those devices. Industrialized countries in North America, Western Europe and China emit so much ELF energy… that it can be sensed by satellites in space. 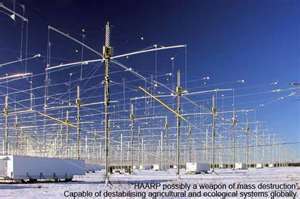 From an article at Rense.com on "Aerosol and Electromagnetic Weapons in the Age of Nuclear War"… Amy Worthington reports that… "According to University of Ottawa Professor Michael Chossudovksy, the military's High-frequency Active Auroral Research Program (HAARP), operating in Alaska as part of the Strategic Defense Initiative, is a powerful tool for weather and climate modification. The Exponential growth in background EMF radiation models are caused by the accelerating pace of our technological progress. It is the electromagnetic pollution of this explosive part of our technological evolutionary curve, we are entering… right now in history. This is due to the uncontrolled accelerating expansion of the multi-national Corporations to produce greater weapons of mass deception, destruction, and manipulation of the people, to help ensure our safety from ourselves. This exponential curve in background EMF radiation equals the exponential curve of the quantum singularity described earlier by Peter Russell… and the Omega Point described by Teilhard de Chardin and may signal our end as a species… with the exponential curve of all the other environmental pollutants that are rising on this planet… unless we wake up to these potential hazards and do something about it. The EMF radiation is positively ionizing us to death on the cellular level… and what we need to do for starters to reverse the effect… is surrounding ourselves with Negative Ions in nature. We know that with the acceleration of technological progress in the 21 century… Air traffic is up sharply. Some 15 million commercial flights annually have increased artificial cloud cover 20% over heavily trafficked air routes in the USA…10% in Europe, and 10% averaged over the entire US. 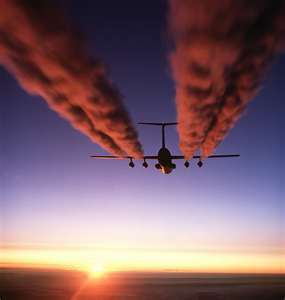 Contrails and chemtrail may also be responsible for recently discovered “global dimming”… which cannot otherwise account for sharply decreased levels of sunlight over some regions of the planet… this is according to the investigative journalists William Thomas- Reporting a seven year investigation into Chemtrails Source. 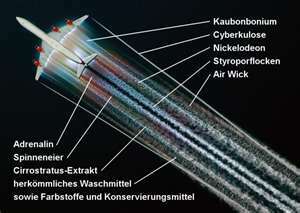 Thomas states that, "Contrails form when water vapor clumps around dirt particles acting as nuclei. According to NASA and the National Oceanic and Atmospheric Administration, contrails can only form at temperatures below minus 76 degrees, and humidity levels of 70 percent or more. Even in ideal conditions, contrails rarely last more than 20 minutes. However, he states… atmospheric studies by NASA and NOAA… including TARFOX, ACE-Asia, ACE-I and II, INDOEX and Project SUCCESS… confirm that artificial clouds and contrails can be manufactured under conditions of low humidity by dispensing particles from aircraft. The smaller the size of the nuclei introduced into the atmosphere, the greater the rate of artificial cloud formation. William Thomas from his study says… Chemtrails is the term widely used to describe the brilliant white plumes laid down by U.S. Air Force tanker planes photo-identified over North America and a dozen other allied nations. Unlike normal condensation trails which form when hot engine exhaust momentarily condenses in the frigid stratosphere like exhaled breath on a cold day… chemical trails linger for hours, turning clear skies into milky haze in a process the U.S. Air Force calls… aerial obscuration… Thomas speaks of a landmark study done by Mark Steadham, In Texas, using Flight Explorer software to identify all aircraft leaving ‘trails over Houston during the winter of 2000. Steadham found that the plumes left by identified commercial airliners lasted on average 22 seconds before dissipating… Plumes left by multi-engine military aircraft in the same airspace at the same time lingered four to eight hours. Amy Worthington at www.globalresearch.ca reports that… It was the late Edward Teller director emeritus of Lawrence Livermore National Laboratory who in 1997… publicly outlined his proposal to use aircraft to scatter in the stratosphere millions of tons of electrically-conductive metallic materials, ostensibly to reduce global warming . In 1998, the conference Teller addressed… convened the world’s top scientists to discuss a “Planetary Emergencies” from global warming… Teller called for an aerial sunscreen [Chemtrails]… Computer simulations at Lawrence Livermore national lab showed no net temperature increase over 85% of the Earth despite an expected doubling of atmospheric CO2 by 2050. Shortly after Teller's presentation, Worthington says, the public began seeing chaotic chemtrailing. In 2000, CBS News admitted that scientists were "looking at drastic solutions for global warming, including manipulating the atmosphere on a massive scale." CBS confirmed that the plan to load the air with tiny particles would "deflect enough sunlight to trigger global cooling." From another study, investigative journalist William Thomas reports… In an interview with Columbus Alive magazine, two scientists working on Chemtrails at Wright-Patterson air force base in Ohio told award-winning reporter Bob Fitrakis that there are two projects currently underway. One is aimed at reducing catastrophic global warming by spreading sunlight-reflecting particles in the atmosphere. Another project involves spreading temporary barium “antennas” in the sky to “duct” or conduct radio and radar waves over the horizon for tactical military operations. Barium chemtrails were spread over Afghanistan, the scientists said, to relay radio commands to remotely piloted Predator drones. One scientist expressed concern that chemtrails could be precipitating pathogenic bugs out of the upper atmosphere, bringing them down to people on the ground. From an article on "Chemtrails Confirmed" [willthomasonline.net] Thomas reports, that Canadians were the first to complain about chemtrails to their federal government. On Nov. 18, 1999, NDP Defense critic Gordon Earl petitioned Parliament on behalf of 550 residents of Espanola, Ontario to repeal any law that would permit the dispersal of military chaff [strips of metal foil dropped by an aircraft to confuse enemy radar by creating false blips] or of any cloud-seeding substance whatsoever by domestic or foreign military aircraft without the informed consent of the citizens of Canada thus affected. According to CBC Newsworld (Aug 29, 1999), many in the community have reported respiratory problems and strange aches and pains. Town council heard that some believe military jets are dropping material over the town as part of a weather experiment… after laboratory tests confirmed the presence of aluminum in rainwater falling through chemtrails over Espanola five-times higher than provincial health safety limits. The Ministry of Defense eventually replied… it is not us. Scientists say aluminum oxide as inert as sand poses no toxic threat. However, after examining more than 3,000 health studies published since 1997, the U.S. Environmental Protection Agency confirmed a strong link between tiny particulates and thousands of premature deaths each year. And according to a New York Times feature, Tiny Bits of Soot Tied to Illnesses (April 21, 2001), numerous health studies show that microscopic motes… composed of metals, carbon and other ingredients… are able to infiltrate the tiniest compartments in the lungs and pass readily into the bloodstream and have been most strongly tied to illness and early death, particularly in people who are already susceptible to respiratory problems. In a report headlined, Tiny particles can kill New Scientist (Aug. 5, 2000) reported a Harvard Six Cities study, which identified particles with a diameter of less than 10 microns as threat to public health. People are human bacteria hybrids… in it, he says, “Most of the cells in your body are not your own, nor are they even human. They are bacterial. From the invisible strands of fungi waiting to sprout between our toes, two kilograms of bacterial matter in our guts, we are best viewed as walking "super-organisms," highly complex conglomerations of human cells, bacteria, fungi and viruses. That's the view of scientists at Imperial College London, who published a paper in Nature Biotechnology Oct. 6 describing how these microbes interact with the body. The scientists concentrated on bacteria. More than 500 different species of bacteria exist in our bodies, making up more than 100 trillion cells. Because our bodies are made of only some several trillion human cells, we are somewhat outnumbered by the aliens. It follows that most of the genes in our bodies are from bacteria, too. Luckily, for us, the bacteria are generally commensal, sharing our food but doing no real harm. They do this through close interaction with our immune systems. The article goes on to say that understanding the workings of the super-organism, is crucial to the development of personalized medicine and health care in the future because individuals can have very different responses to drugs, depending on their microbial fauna. The medical establishment along with the food establishment...i.e. General foods have no intention of telling the average Sheeple how to get rid of the excess baggage they carry in unwanted bacteria and virus… they just want to help the obese Sheeple with their problems dealing with a shorter lifespan. Body count Total = "100 trillion cells"… Us… human only "several trillion" 'human cells'"
The significance of this is seen in another article I researched…by Jerry Adler and Jeneen Interlandi, NEWSWEEK, October 29, 2007 on… Our war on microbes has toughened them. Now, New Science tells us we should embrace bacteria. In this article they state, “An electron microscope would reveal that you are teeming with other life-forms. Any part of your body that comes into contact with the outside world… your skin, mouth, nose and (especially) digestive tract… is home to bacteria, fungi and protozoa that outnumber the cells you call your own by 10, or perhaps a hundred, to one. There are thousands of different species, found in combinations "as unique as our DNA or our fingerprints," says Stanford biologist David Relman, who is investigating the complex web of interactions microbes maintain with our digestive, immune and nervous systems. Where do you leave off, and they begin? Microbes, Relman holds, are "a part of who we are." Relman is a leader in rethinking our relationship to bacteria, which for most of the last century was dominated by the paradigm of Total Warfare. We try to kill them off with antibiotics and hand sanitizers. But bacteria never surrender; in the early years of antibiotics, doctors dreamed of eliminating infectious disease. Instead, a new paper in The Journal of the American Medical Association reports on the prevalence of (MRSA), Methicillin resistant Staphylococcus aureus which was responsible for almost 19,000 deaths in the United States in 2005… -about twice as many as previously thought, and more than AIDS. Elizabeth Bancroft, a leading epidemiologist, called this finding "astounding." We can see how the medical establishment is helping… trying to kill off the bad Bacteria with antibiotics… having made them stronger and the immune function of the human body weaker. Subsequently with the help of the junk food Industry having released into the formally human body an invading force of trillions of Aliens out-numbering the human population by ten to 1 or perhaps a hundred to one as stated by Stanford biologist David Relman. In yet another article by Claire Coleman… Dr. Nicholas Perricone argues that aging is a disease " 'As controversial as that might sound, I truly believe aging is a progressive inflammatory disease that occurs at a cellular level and, as such, you can fight it,' he says' 1 When it comes to top-of-the-range skincare and a straight-talking, holistic approach to looking and feeling younger, Dr Nicholas Perricone is the man for a host of Park Avenue princesses and Hollywood's leading ladies. But while most dermatologists accept that their job is to try to minimize the effects of ageing, Dr Perricone's turns traditional thinking on its head. Far from seeing wrinkles and sagging skin as an inevitable result of getting older, he argues that ageing is actually a disease. Coleman goes on to say, “No surprise that diet is one of the founding principles of Perricone's latest plan. 'Good underlying bone structure and muscle mass are the foundations of a youthful face,' says Perricone. 'Loss of muscle mass is the result of inflammation, so an anti-inflammatory diet that helps maintain muscle mass and prevent osteopenia (a weakening of the bones) is essential.' However, one of the other issues with age is that the subcutaneous fat that plumps out the skin is lost, so the diet also has to include nutrients that will help maintain, and promote, these fat levels. Based on the Perricone Prescription, this means lots of high quality protein, (wild Alaskan salmon, free-range chicken, shellfish and tofu) essential for cellular repair and the building blocks of muscle tissue. He first hit the headlines in the early Nineties with his books, The Wrinkle Cure and The Perricone Prescription, which claimed that a diet rich in salmon and berries could help you look younger within as little as three days. This anti-inflammatory diet, rich in lean proteins, antioxidants and essential fatty acids, is just one of the keystones of the Perricone approach. The other two are potent antioxidant supplements and the doctor's range of anti-inflammatory topical skincare. The beauty industry knows… how ugly people feel when they look in the mirror at a quarter of a century old… and want to help… causing these old ladies to spend more than a third of their wages on looking good… to ignorant men who do not have a clue what real beauty is. Want to change your looks? Iodine re-establishes the integrity, looks, (and healthy glow) of your body back to its youthful good looks and its own native genes by cleaning up (after) the invading majority. If we want to personally choose health over any other inevitable result for ourselves, how can we not to do everything in our power to try and restore the naturally pathogen-free, deficiency-free body, to actually see the result of 100% sufficiency of Iodine… to clear the wastes and junk built up as sediments… within these miracle self healing organisms and allow the body to heal, giving the standard seven years it takes for your body to naturally replace each cell with a new one?... Matt Erwin reporting on research by Dr. Donald Miller MD… Matt Erwin explains… When one clearly examines the statistics on causes of death from the Center for Disease Control it becomes quite clear that sepsis is actually the leading cause of death in non-coronary ICU patients. If most of us are actually dying from pathogenic sepsis, [the condition or syndrome caused by the presence of microorganisms or their toxins in the tissue or the bloodstream] it stands now to reason that we should go after and identify the process, and point of entry of these pathogenic infections into our sterile healthy bloodstream? The body is designed to have no pathogens invade and/or infect the body internally. Medical and healing professionals receive the training and understanding that the entire digestive tract is actually considered to be external to the body. Both the blood circulatory system and the urinary tract is considered to be internal and designed to be sterile and pathogen free. The substance of iodine dissolved into the body, tissues, and internal organs all the way down to the cellular level (as designed) will simply not allow either the pathogens, or their sepsis 3 forming byproducts to exist internal to the body and bloodstream, or the stopping up and clogging up of the cellular solution with metabolic wastes to the point that cells are simply not healthy and age free… because they can neither breathe… nor eventually eat and properly get rid of waste. The overall question regarding pathogens in the personal human disease/ mortality/ survival equation… Matt Erwin explains… is one not taken at all lightly by the top medical experts. In a recent medical Journal recipient poll the headline reads: "Sanitation chosen as greatest medical advance since the 1840s". We are just beginning to understand some of the root mechanisms that may govern the phenomena of aging and possibly now cancer. Recent findings suggest it may be apparently as simple the resultant complications due to the step by step gradual choking off of the oxygen rich blood supply to cells in an isolation created through years of an unnatural buildup of foreign matter and metabolic wastes in the sponge that makes up the fleshy tissues of the body. This choking off is normally referred to as allowing the formation of cysts. Potassium Iodide ( Iodine ) is being discovered to be the irreplaceable, and indispensable resident healer and housekeeper for cleaning up the dissolved metabolic wastes and metals that can otherwise clog up the skin, flesh and bog down efficiency of the organs at the cellular level causing the oxygen and essential nutrients to be unable to get through. As a result, the aging process simply overtakes the organism instead of allowing the body to be the self healing / self rejuvenating bio-machine medical science knows the body to be by way of standard cell replacement cell-for-cell every seven years. Pioneering doctors and cutting edge researchers are uncovering the fact that the RDA for Iodine is actually 100x too low. (Dr. Miller ) and that most humans are actually in various stages of this pronounced level of iodine deficiency. The now fully identified resultant thyroid and health complications are grossly compounded by Man's introduction of an imbalance of the other halogens (Dr. Miller)… such as fluorides, and chlorines added directly to the water supply many use for drinking, and demonstrates the actual need for direct inexpensive supplementation to re-achieve a healthy bio-sufficiency dissolved into our tissues, blood, and organs for continued health. When was the last time you were personally relatively free of such a body wide siege Erwin asks… at what age… seven and how did you feel back then? What was your energy level and health like? If what Science Biology tells us is true… the entire body is replaced every seven years through standard cell replacement. Then why do we not have our eight year old skin or our 18 year old silhouette? Could it be the competing build up of foreign and invading substances and the large percentage of cells not even our own… competing more and more and taking over… as this WIRED article suggests, due to the deficiency of iodine and other things as Dr. Miller suggests? Should people really have to lose their drop dead attractive figure, flexibility, and sexiness before 750? Could the earliest Biblical writings on age and earlier lifespan of humans be correct? Searching the internet, we find they are quite close to it on the purely genetics front as well... (Lab rats living 10xs longer now etc as they are no longer feeding the multitudes of bacteria and virus.). A powerful answer to our dilemma came from researching the internet and from a website called doctorersaredangerous.com/articles, is a report by Donald W. Miller, Jr., MD on Iodine for Health. [http://www.donaldmiller.com] in this article Dr. Miller states that, ‘There is growing evidence that Americans would have better health and a lower incidence of cancer and fibrocystic disease of the breast if they consumed more iodine. A decrease in iodine intake coupled with an increased consumption of competing halogens, fluoride and bromide, has created an epidemic of iodine deficiency in America. Dr. Miller goes on to say, ‘Iodine has an important and little understood history. This relatively scarce element has played a pivotal role in the formation of our planet’s atmosphere and in the evolution of life. For more than two billion years there was no oxygen in the atmosphere until a new kind of bacteria, cyanobacteria (blue-green algae), began producing oxygen as a byproduct of photosynthesis. Cyanobacteria also developed an affinity for iodine. The most likely reason is that these organisms used iodine as an antioxidant to protect themselves against the free radicals that oxygen breeds (superoxide anion, hydrogen peroxide, and hydroxyl radical). Studying kelp, researchers have shown how iodine does this and have found that kelp will absorb increased amounts of iodine when placed under oxidative stress. Other researchers have shown that iodine increases the antioxidant status of human serum similar to that of vitamin C. He describes in the various articles on his website how Iodine also induces apoptosis, programmed cell death. This process is essential to growth and development (fingers form in the fetus by apoptosis of the tissue between them) and for destroying cells that represent a threat to the integrity of the organism, like cancer cells and cells infected with viruses. Human lung cancer cells with genes spliced into them that enhance iodine uptake and utilization undergo apoptosis and shrink when given iodine, both when grown in vitro outside the body and implanted in mice. Its anti-cancer function may well prove to be iodine’s most important extrathyroidal benefit. Iodine has other extra-thyroidal functions that require more study. It removes toxic chemicals – fluoride, bromide, lead, aluminum, mercury – and biological toxins, suppresses auto-immunity, strengthens the T-cell adaptive immune system, and protects against abnormal growth of bacteria in the stomach. In addition to the thyroid and mammary glands, other tissues possess an iodine pump (the sodium/iodine symporter). Stomach mucosa, the salivary glands, and lactating mammary glands can concentrate iodine almost to the same degree as the thyroid gland (40-fold greater than its concentration in blood). Other tissues that have this pump include the ovaries; thymus gland, seat of the adaptive immune system; skin; choroid plexus in the brain, which makes cerebrospinal fluid; and joints, arteries and bone. Today’s medical establishment is wary of iodine (as they are of most naturally occurring, non-patentable, non-pharmaceutical agents). The final bit of research we will look at in our search to maintain our human status and defeat the enemy invaders is to look into Whey Peptides from quality protein powders. As early as 420 B.C. in ancient Greece, Hippocrates, the "Father of Medicine," recommended whey, with its health promoting benefits, to his patients. And in Europe in the middle ages, doctors promoted whey as a health tonic. Today, scientists continue to research and discover even more ways that whey protein powders can potentially benefit you. "All of the nearly 40,000 distinct proteins found in the human body are made from only 20 amino acids called the photogenic amino acids." In addition, there are four amino acids in the configuration of DNA; the combinations of those four comprise the genetic code and this code then becomes rearranged as RNA, which processes other proteins using other amino acids." Peptides are chains of free amino acids linked together-usually in two (di-peptide) or three (tri-peptide) combinations… and are the preferred method for the human body to absorb and utilize nitrogen in the muscles because they can be absorbed intact. After 22 international protein absorption studies, conducted over about 13 years, scientists finally agree. Peptides are the preferred method of the human metabolism to absorb and utilize amino acids. Here are the facts on peptides in published scientific research in black and white. Did you know that: Peptides are absorbed up to 234% faster than a comparable free form amino acid mixture or regular whole protein molecules? 1 Whey peptides promote gastrointestinal health and augment liver function? (2) Whey peptides can ease pain through opioid activity? (3)… Whey peptides increase absorption and nitrogen retention over 68% better than regular whey? (4)… 70% of all nitrogen in the bloodstream is found in peptide form after you've digested protein? (5)… Protein levels are 84%-95% greater with a peptide diet than with an intact protein diet due to action of peptide transport systems in the intestine? (6)… The faster protein is absorbed, the more it stimulates protein synthesis in the body? Protein synthesis is necessary for muscle growth and repair. (7) … Peptides stimulate more Insulin growth factors-1 (IGF-1) release than amino acids? IGF-1 is one of several hormones that stimulate muscle tissue to grow. (8) Many peptides have biological activity? For example, when the minor whey protein lactoferrin is digested, antibacterial peptides are released. (9) And when lactoglobulin, the major protein fraction found in whey is digested, antihypertensive peptides are released. (10) Peptides can lower appetite… Milk proteins (casein and whey) contain a powerful peptide called glycomacropeptide. Among its many biological functions, glycomacropeptides stimulate the release of CCK, a hormone that signals the brain you are full. (11) Milk proteins are the main source of biologically active peptides. (12) references page 434.